Having earned my stripes as Program Director at a local Alternative Rock radio station in the mid 90’s here in town called KXBS the Bus, and then launching a national publication, Buzzine Magazine as Vice-President and Editor-in-Chief, I’d like to think I know music. And though I haven’t been working in the industry for a number of years – opting instead for stability and a steady pay check to cover the mortgage – my first love continues to be music and so in my spare time I do what I can to support our local music scene with VenturaRocks.com. Recently I was approached about a band I hadn’t heard of before who would be playing some shows in Ventura and they were hoping to get some support on the website. My first introduction to the Winchester Rebels was via YouTube and a video of the band performing an acoustic version of their song, “Loaded Gun” on Santa Barbara’s radio station, KJEE. I was immediately intrigued and made it a plan to check out the band which was playing at Billy O’s. After one song, it was clear the band belonged on a much larger stage with a much larger crowd. And though the house wasn’t packed, the guys played as if it were. I left wanting more and so I decided to spend some time with The Winchester Rebel’s debut release, 3 Sheets to the Wind. Without a doubt, this is one of the best indie band endeavors I’ve heard in quite some time. Nick Fitzgerald writes all the music as well as the guitar parts and Nick Hunt writes all the lyrics. I’m impressed and I readily admit the CD hasn’t left my car, except to rip tunes for my workout playlist for my MP3 player (I added “Down” and “Flying”). All five members of Winchester Rebels are solid players and bring something special to the table. Songs like “Private Angel” and “Silence” remind me yet again how much fun I’m missing having never learned to play drums. The band’s fat sounding bass never gets lost in the mix laying down the band’s groove, creating a fine balance between rhythm and harmony. The guitars work extremely well complementing each other driving the songs (love the solo in “Dining with the Devils”), and Nick Hunt’s vocal arrangements are incredibly captivating; he has a voice worthy of filling the Staples Center in Los Angeles. Here’s the thing, reading about music without hearing it, is like someone trying to describe a full-length body massage without actually ever experiencing one. Yea, you can explain how amazing it feels and how it will take you away to a special place, and… blah, blah, blah, blah, blah. You get the picture. So until you actually sit down and give the Winchester Rebels a listen, you won’t know. 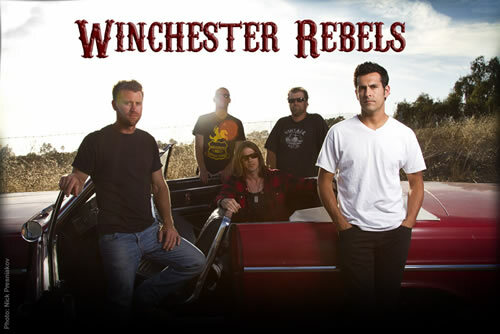 Go online to Reverbnation.com/WinchesterRebels and give them a spin for yourself. Then demand they come back to town and play it live.